Use the teamforge script to deploy and undeploy services, start and stop services, verify the status of services, verify the application environment, bootstrap or migrate data and do much more. Important: Starting from TeamForge 17.8, /opt/collabnet/teamforge/bin/teamforge has been linked to /usr/bin. You can simply run the teamforge command from any path. 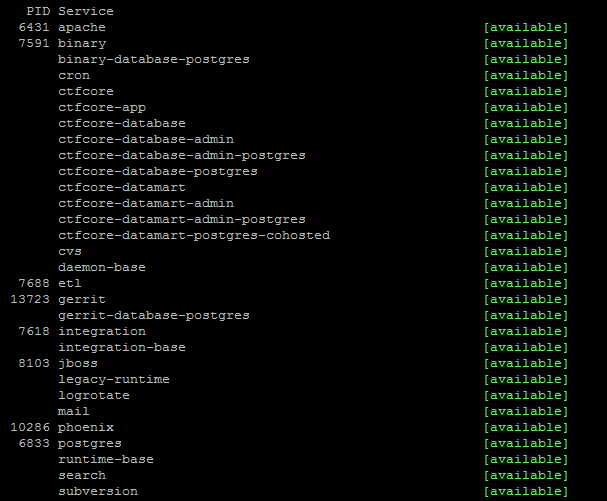 TeamForge comprises of a set of components such as ctfcore, subversion, james, and so on. Some components are always required to be installed, while others are optional. By spreading these components over multiple RPMs, we make sure that users do not have to install everything all the time. Though this is valuable, RPMs alone prove insufficient to manage the components and their inter-dependencies. Some components do not have a physical representation but are configuration-only. RPM dependencies are restricted to the local machine only; however, in a distributed installation, dependencies between components must be tracked across servers. In addition to the physical componentization (using RPMs), there is also a need for a logical componentization of TeamForge. Services represent a logical component of TeamForge. Such a logical component may either be a feature, which the user explicitly opts to install (for example, CVS) or a technical component (for example, Apache and Logrotate), which other services depend on. Services come with additional metadata which makes it possible to track and manage dependencies to a more fine-grained level. Deployment dependencies specify which other services need to be deployed locally. Provided Endpoints specify which network endpoints the service offers. Required Endpoints specify which network endpoints the service depends on. As such services are more fine-grained than RPMs and it is common to have a single RPM containing multiple services. Uninstalled: A service is uninstalled if the RPM that contains it is not installed. Uninstalled services do not exist as far as TeamForge is concerned. Undeployed: The RPM containing the service is installed, but the service has not been deployed yet. Deployment is also referred to as "creating the runtime", but is specific to one service. Dependencies unavailable: The service itself might be available, but at least one of its deployment dependencies is not in "Available" state. Available: Service is fully functional. Not bootstrapped: Data structures have not been initialized yet. Not migrated: Data structures are initialized, but data needs to be migrated. Ports Blocked: The service is impeded from starting up because at least one of the ports it needs is in use by a different process. Stopped: Service is an auto start-type service, yet is stopped. Inactive: Service is a demand start-type service and is stopped. Starting: Service is in the process of starting up. Available: Service is running and healthy according to its health check. Unhealthy: Service is running but unhealthy according to its health check. Dead: Service is supposed to be running, but the process disappeared. Doomed: Service is technically running, but it will never work properly because some part of it failed to initialize properly. Stopping: Service is in the process of stopping. Use the -f parameter to pass the site-options.conf file's path as a command line parameter (default is /opt/collabnet/teamforge/etc/site-options.conf). Pass this parameter if you want to skip environment verification. Pass this parameter if you want to skip confirmation prompts. Show status of all services. Use the -s parameter to know the status of a specific service. Bootstrap data (re-create data structures). Use the -s parameter to selectively bootstrap a specific component. Suppose, you did not have SVN on your TeamForge site and if you add SVN while upgrading to TeamForge 16.10. You can now selectively bootstrap SVN alone. Migrate data to latest schema. Provision/reprovision machine. The "provision" command performs tasks such as creating the runtime, starting and stopping services, bootstrapping (fresh install) or migrating (upgrade) data, deploying services, setting file permissions, setting SELinux permissions, initializing services and so on. Applies the TeamForge filesystem permissions when you restore the TeamForge data in a new server while upgraing to a latest TeamForge version. Dumps relevant diagnostic information to the console (stdout) for each deployed service. teamforge script writes entries to /opt/collabnet/teamforge/log/runtime/runtime.log file.